Black and white photographs courtesy of Mike Svec, U of Ill. alumnus and former UIAS member. 1895 June: The Illinois state legislature approves an appropriation of $15,000 for the construction of a student's astronomical observatory. 1896 April: Construction begins on the Observatory. The building is complete by August at a cost of $6,800. The 12-inch Equatorial Telescope arrives in November, observations begin immediately. 1897 October: Director G.W. Myers announces the discovery of the source of the star Beta Lyrae variability. The Celestial Mechanics course offered by Myers has the largest enrollment of any similar course in the United States. 1900 September: Myers leaves Illinois for the University of Chicago. 1903: Dr. Joel Stebbins arrives from Lick Observatory and takes over as the Observatory Director. He soon begins a study of the brightness of 107 double stars. 1905: Stebbins receives a budget of $750 for the first time. 1907 June: Stebbins begin working with physicist F. C. Brown to apply selenium cells to the measure the brightness of the moon. This represents the first time in America electricity is used to measure astronomical brightness. Use photometer to observe July 24th lunar eclipse. 1910 May: Stebbins studies Comet Halley with the selenium photometer. 1911: Percey Whisler is awarded the first Masters degree in astronomy. 1912: Stebbins uses the selenium photometer to discover four stars to be eclipsing binary stars: Beta Aurigae, Spica, Alpha Coronae Borealis and Delta Orinois. 1912 December: Physicists W. Shultz and Jakob Kunz make their first observations using a photoelectric cell instead of selenium cells. They observed the star Capella. Stebbins and Kunz begin to improve the new photoelectric photometer. 1914: Stebbins receives the Draper Medal from the National Academy of Science. 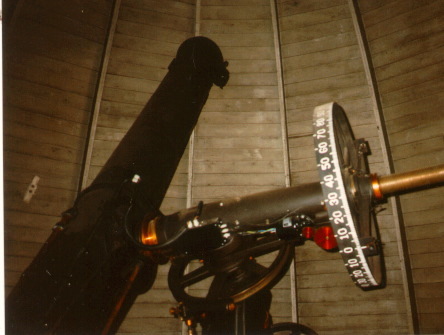 A 30-inch reflecting telescope is built and placed in an annex observatory just southeast of the Observatory. 1915: Stebbins uses the new photometer to study Beta Lyrae. Lick Observatory duplicates the Illinois photometer. Stebbins receives the Rumford Medal from the American Academy of the Arts and Science. 1918 June 9: Stebbins and Kunz observe the solar eclipse from Wyoming with the photometer. 1919: Stebbins serves on the American deligation sent to Europe to rebuild the war torn International Astronomical Union. 1908: Stebbins uses the selenium photometer to measure the change in brightness of the star Algol. The sensitive photometer helps Stebbins identify new features of the binary star system, proving the usefulness of the photometer. 1922: Charles Wylie earns the first Illinois Doctorate in astronomy. Stebbins leaves for Washburn Observatory in Wisconsin. Dr. Robert H. Baker becomes the new Director. 1925: The 30-inch telescope is rebuilt and moved farther south to Florida Avenue. It is equipped with a new photoelectric photometer. The 30-inch is replaced in 1938 with a photographic telescope. 1930: Baker publishes his first book Astronomy. He would also author The Universe Unfolding, When the Stars Come Out, An Introduction to Astronomy, Introducing the Constellations and Stars: A Guide to the Heavens. 1933 May 27: Light from star Acturus falls on a photocell in the Observatory's annex and sends a signal to open the Chicago World's Fair. The Depression leads to cuts in the astronomy departments budget, which is now only $200 a year. 1939-1951: Baker uses the photographic telescope to count the stars in the Milky Way and determine the stars' distribution. This was part of the Harvards' Star Counting Circuit. 1954: George McVittie arrives as new Astronomy Department Chairman. He begins to modernize the department and the facilities. By 1956 the department expands to 4 astronomers and requires an addition be added to the Observatory. 1957: The American Astronomical Association meets in Urbana with Stebbins and Baker attending. Stebbins delivers key note speech on his photometric work at Illinois. Astronomy club builds a radio receiver which serves as a tracking station for Sputnik. 1959: The Vermillion River Radio Observatory opens near Danville. A 400 x 600 foot cylindrical dish is cut into the ground. A 120-foot dish is added in 1970. The entire facility is closed in 1978. The 120-foot dish is disassembled in 1994 and sold for scrap. 1966: A second addition is added to the east side of the Observatory. The photographic telescope in the Florida Ave observatory is closed and moved to the future Prairie Observatory site were it remains until vandels steal the optics and damage the telescope mount in 1985. The remains of the mount and the dome are sold to the Champaign -Urbana Astronomy Club and used by them to build an observatory south of Champaign, while the mirror is on display in the Astronomy Department. 1967: The 12-in is used for the last time for professional photometric observations to observe RZ Cassopeia. 1968: The Prairie Observatory, near Oakland Illinois, is opened. The 40-inch telescope is used until 1981 when it was moved to Mount Laguna California. As a tribute to his former math professor, George McVittie, Arthur Clark makes Urbana the birthplace of the supercomputer HAL in the book and movie 2001: A Space Odyssey . 1970: The International Astronomical Union recognizes Stebbins by naming a large crater on the far side of the moon (65 deg. N latitude, 143 deg. W longitude) in his honor. Additional honors included the designation of asteroid 1953TG2 as 2300 Stebbins and asteroid 1964CD as 2417 McVittie. 1979 The Astronomy Department moves out of the Observatory to a new larger building on Springfield Avenue. The department has grown to 15 astronomers. 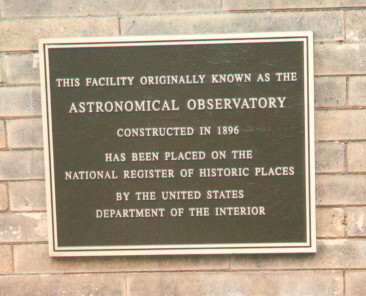 1986 November 6: The Observatory is listed on the National Register of Historic Places. Over 5000 people visit the Observatory to see Comet Halley. 1989 December 20: The Observatory is declared a National Historic Landmark by the U.S. Department of the Interior. Robert Stebbins, the son of the Joel Stebbins attends the dedication ceremony which coincides with the opening of the new Astronomy Building on Green Street. 1990: The Preservation and Conservation Association of Champaign presents the Observatory the Landmark Heritage Award. 1994: May 10 Observatory is near the center of an annular eclipse. On a perfect day, over 500 people visit the observatory to view the eclipse. 1996: Renovation on the dome begins, as the Observatory is prepared for its centennial; this includes an overhaul of the dome machinery, stripping and repainting the interior of the dome, and repairing the exterior balcony. 2003 September: Over 1000 visitors come to view Mars' favorable opposition through several telescopes, including the 12". 2005 May: Mike Lockwood and (Richard Jarnot?) clean and realign the 12" objective lens. 2007 February: a squirrel chews its way through the lip of the dome and gets in. Before finding a way out, it chews through several years of logbook entries, found in shreds on the floor. 2008/9 winter break: Profs. Leslie Looney and Benjamin McCall [and one other person, who?] build a spectrograph in the main-floor room 124, for student use. An optical fiber runs up to the dome. That winter, they teach an astrochemistry class, in which students calculate the strength of the blue absorption line of the methylidyne radical (CH), and then measure the line's depth in the spectra of distant bright stars, hoping to estimate CH's interstellar abundance. 2013 May-September: Telescope renovation. With a $50,000 grant from the University and support from the Friends of the Observatory, especially Craig Sutter, the 12-inch telescope and its mount are removed from the Observatory in May and taken to Swarthmore, Pennsylvania to be refurbished by Chris Ray and Fred Orthlieb of Ray Museum Studios. Over the summer, the Observatory and dome are repainted. The telescope returns in August, but needs further work, so it goes back into service in September. Apparently the last major overhaul of the telescope mechanics had been in 1953.